I am desperately trying to obey all jinxing rules and stick to my self-imposed “Don’t jinx the 2013 Red Sox season by writing about them” rule. Last night made it really, really hard. Really hard. Really, really hard. So please, don’t consider this an actual column about the 2013 Boston Red Sox. All jinxing strategies remain intact. Instead, enjoy the complete list of classic Fenway moments during the Fan-Filmed YouTube era (2004 to now) that (a) caused utter pandemonium on One Yawkey Way, and (b) will give every Boston fan goose bumps on their goose bumps as they watch these clips over and over again. You’re not gonna believe this, but David Ortiz is involved in a few of them. it’s like the Zapruder film of baseball moments. You’re watching what seems to be a normal at-bat and then BOOM! Dave Roberts zips into the screen and changes the franchise forever. I can’t decide whether I wish there were sound for this or whether I love that there’s no sound for this. Game 4, 2004 ALCS (vs. New York) — The same cameraman captures Billy Mueller’s single off Mariano that drove in Roberts, tied the game in the ninth and gave the self-proclaimed Idiots new life. You gotta love YouTube user akjaybo74 — he only uploaded three YouTube videos in his life, but all three came from the game that altered the destiny of the Boston Red Sox and allowed my father to die some day while saying that he saw the Red Sox win a World Series. Thank you, akjaybo74! and yet it’s still tremendous. This one staved off a Yankee sweep and happened in the wee hours of Sunday night. Earlier that same day, the Patriots beat Seattle in Foxborough to keep their win streak going. I always thought that would end up being our greatest Pats-Sox combo day. Nope. only our cameraman didn’t start filming until a couple seconds after the big hit. See, we were still figuring out the whole Fan-Filmed YouTube thing in 2004. Baby steps. Game 5, ALCS 2004 (vs. New York) — Our first great fan-filmed YouTube clip at Fenway includes actual sound (hey, cool — sound!) and some Blair Witch–type camerawork that totally pushes it over the top. You even get treated to some solid incoherent shrieking in the stands and half-decent camerawork after the cameraman recovers from briefly losing his mind. Also, this was probably the most unforgettable 30-hour fan experience of my life. Other than that, no big deal. 9-12-07 (0:55 mark) — Papi belts a walk-off two-run homer (trailing by one in the ninth) against Tampa during the stretch run in September, as the Red Sox were trying to win the AL East (they did) and get home field (they did). Bonus points for improved camerawork (with a choppy cell phone, no less) and close-up shots of the celebration. We’re heading to a better place with this YouTube thing, you can feel it. Game 2, 2007 ALDS (vs. Anaheim) — Can I interest you in a special Manny Ramirez cameo titled “Manny takes it to the Mass Pike?” Here’s Manny finishing off the Angels with a walk-off granny bomb — although the cameraman didn’t catch the part where Manny dropped his bat and looked at his own dugout as his teammates poured out of it (which eventually became my permanent Twitter avatar). This clip makes me feel all gooey inside. Game 6, 2007 ALCS (vs. Cleveland) — It’s a special cameo from J.D. Drew’s $14 Million Grand Slam that swung the Cleveland series!!!!! Our cameraman really carries this one — from predicting a big hit, to screaming like a maniac, to even turning the camera on himself. There’s a 1 percent chance this was Jimmy Fallon doing one of his old SNL sketches about crazy Boston fans. PS: Here’s the column I wrote about this homer the following day. 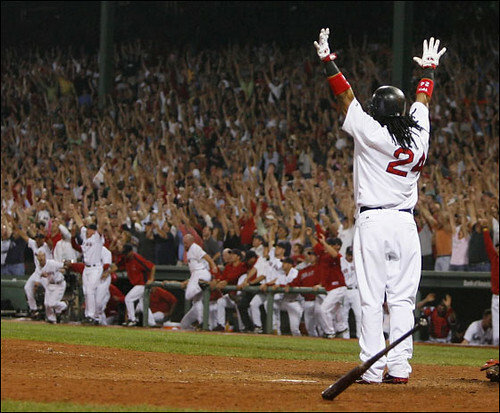 Game 5, 2008 ALCS (vs. Tampa) — Coco Crisp completes the Greatest Playoff Comeback In Red Sox History That Nobody Remembers Because We Blew The Series Two Games Later. This clip sums up that series — it never gets that goose bumpy and abruptly cuts off before we see anyone celebrating. The Red Sox wouldn’t have another fun playoff moment for five solid years. Who knew? Game 2, 2013 ALCS (vs. Detroit) — Thanks to advances in technology, suddenly we’re looking at the Citizen Kane of fan-filmed YouTube clips. You couldn’t pick a better angle (right near the field, right behind home plate facing right field), a better camera (it’s practically in HD!) and a better job filming (the cameraman absolutely crushes his role here — there’s a chance this was Paul Thomas Anderson). Get your goose bumps ready. I don’t know if this will end up being Big Papi’s last great YouTube moment, but I do know this: We’ve come a long way, Fan-Filmed YouTube Clips Of Iconic Fenway Moments!!! I have to go; I want to watch this again.